Not a lot to show today, other than empty choccie wrappers, that is. I'd put finished pics of DD1's cushion on the previous post, if you're interested. HOWEVER, DD1 and I did a trawl of Ikea yesterday, and I came back with the makings of THREE new shelving units for the craft/guest room. We're installing them tomorrow, and VERY excited!!) so hopefully, there'll be some lovely pics next week. Other than dreaming of having somewhere to work, I'm chewing over what to do with this. My brother gave it me nearly 20 years ago, along with the rest of the suite which went to the tip a long time ago. I found some matching Sanderson print and made a 'mob cap' cover some years ago, but it needs a new lease of life. I'm thinking 'Cath K meets Brambly Hedge' work over, so we'll see. Well, that's me for now. I'm off round some other desks here, for a nosey. Hope to see you there! Can't wait to see how you revamp your thingee!! Do you call it an ottoman? Have a lovely week. You've just given me an idea for using some fabric I have and giving a new life to a footstool. Thanks! Look forward to seeing what you do with yours. You should be able to pick up a remnant of some furnishing fabric somewhere to cover that footstool...it'll look great! 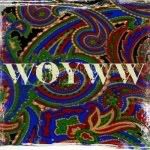 and happy WOYWW. Thanks for dropping by my blog already. Lucky you to not have mozzies there...they are in plague here at the moment gggrrr. Oh fun fun putting the Ikea stuff together and having more storage spots for your art stuff. Oooh Chris, lots of lovely new projects beginning! Very exciting to have the new Ikea shelves, and I am sure it won't be long before they are stuffed with crafty goodies. Love the knitting - what a cute pattern! I laughed at your comment - thanks! Yes, these "pesky" cats of ours can be a pain! They are just like small children. We've got a lot of interesting kitty dynamics going on at the moment because Beatrice is jealous of Phoebe who is now muscling in in Mum's department and she doesn't want to share Mum with anyone else!! Mum has now turned into a complete Cat Slave and I told her this a.m. that there is no hope for her now. Love the idea of making a room into a crafty space, it's always so exciting! 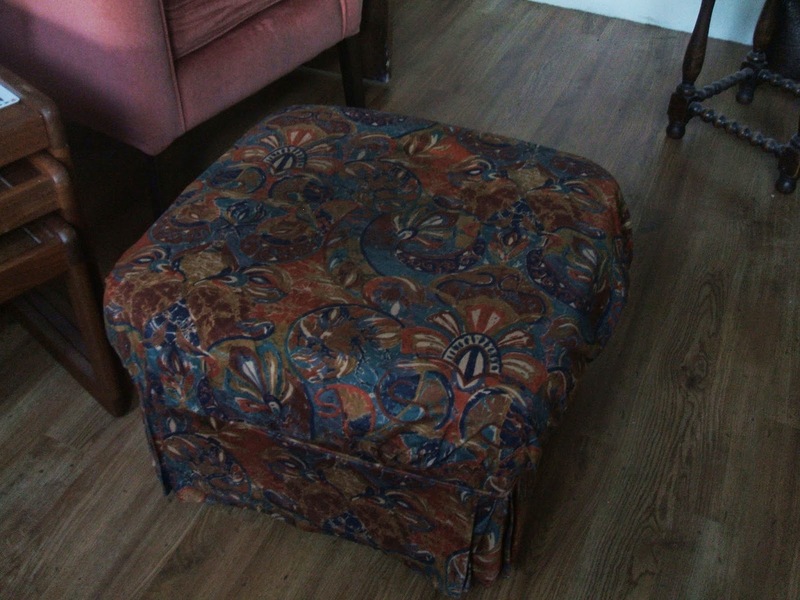 I agree, footstools are very useful things, and that one will look super with a new covering. 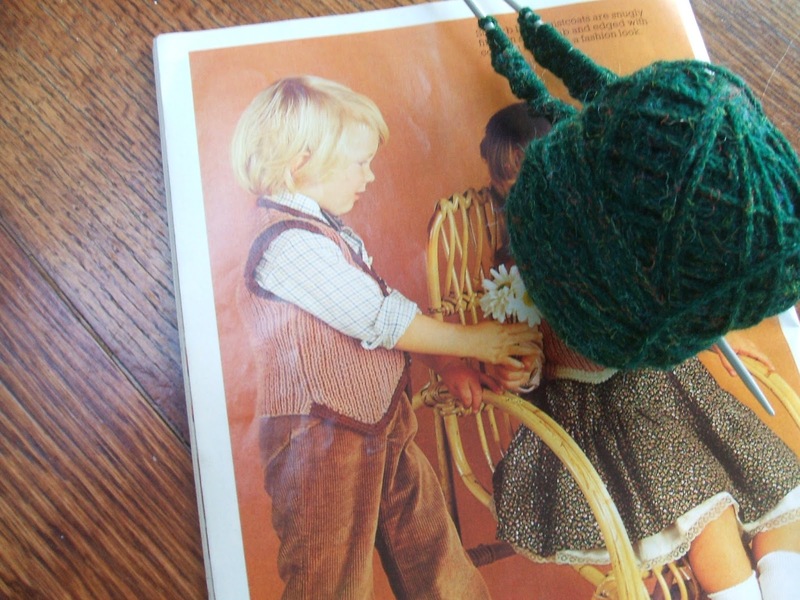 Sweet little knitted waistcoat too, I really must try to knit more than just socks but I'm totally addicted! My craft mat came from the UK, I've seem other crafters with them on their desks too. I was given it so I don't know where it came from but they're available in all sizes. Hi Chris, love the footstool, you could knit it an aran jumper, its very popular at the moment for cushions and the like. love that green color for a vest! another fiber person! thanks for visiting and your kind words. Love the fabric on the foot stool. Haha, empty chocolate wrappers. There are none on my desk because I HIDE all mine, lol. Looking forward to see the finished results of your footstool. Oh, a waistcoat - how cute! I have a new nephew so I'll be keen to see it finished - it might be something that needs to be added to Granny's list! Thanks for your visit, and the nice comments. That stool is going to be fun to cover, staple gun is the easiest thing to use. Look forward to seeing its progress. Thanks for the earlier visit Chris. New storage for the craft area....how exciting this can be. Looking forward to seeing the pics. That footstool is a lovely piece of furniture. It will be interesting to see what you do with it. The waistcoat is cute. Your young man will look quite dapper in it! Love Ikea myself. Too many good things there! Thanks for stopping by and leaving your sweet comments. Cant wait to check out your new stuff for your craft room! Its always so exciting to organize! OOoooo! I can't wait to see your space next week! That ottoman looks like it needs a slipcover is all! Your Godson will look wonderful in the waistcoat you are making! The ottoman's carvings look beautiful, so I think it would be well worth you restoring it. That little vest you're going to work on it looks very sharp too. Blessings! Having a new craft space is always fun. Hope you get those shelves up and are able to show us the reveal next WOYWW. I don't sew anything that requires measuring, so I'd be no good offering ottoman advice. Thanks for your previous visit. WOYWW wishes from # 9. Ooh I love Ikea, have fun putting all your goodies together. Can't wait to see what you do to the foot stool, oh the possibilities. Yes, I too love IKEA! Luckily there is none very close by! Ooo, I like Brambly Hedge... looking forward to what you do with that neat footstool. Does it open up into a workbox? Enjoy filling all the new space when it's up and running. Looking forward to what you do with that footstool-looking thing and your new shelves! Thanks for popping by and happy belated WOYWW! I love Ikea too...such wonderful storage options!! Look forward to seeing your footstool... Thanks so much for visiting me recently, it is lovely to find your blog! thanks for your visit earlier - brakes were applied these last few days so the 'busyness' slowed down!! Very interested to see how that foot stool comes into the 21st Century. Aha! A mob cap makeover! That's just what my pouffe needs - thank you for the idea.